· High sensitivity and measurement accuracy. · Lower detection limits for higher-Z elements, with additional elements Mg, Al, Si and P via helium purge. · Standard analytical range: 25 elements from S to U. · Optional CCD camera for visually identifying and recording images of samples. · A user-selectable 3mm small spot to locate areas of interest on a sample. · Flip-up, color, touch-screen display. · 50 kV x-ray tube provides approximately twice the x-ray flux of a 40 kV x-ray tube. · Hotfoot hot surface adaptor allows testing in petrochemical refineries up to 842°F (450°C). 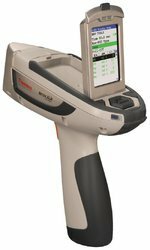 · Standard Thermo Scientific™ Niton Data Transfer (NDT™) PC software suite allows you to set operator permissions, generate custom reports, print certificates of analysis, or remotely monitor, and operate the instrument hands-free from your PC. · Integrated USB and Bluetooth™ communications provide direct data transfer to your PC or networked storage device. Optional accessories include Bluetooth barcode reader, Bluetooth printer, and Bluetooth GPS.